Etech 7 partners with the top IT companies in the industry. We believe that company friends and allies have an immense impact on the overall work environment of a company. For this reason, we look for partners who share the same corporate values as us to create the best experience for our employees and clients. At Etech 7, we treat our partners with the utmost respect and expect the same in return. We believe that the key to fostering any good relationship is finding the right balance between the give and the take. We pride ourselves on striking the perfect harmony between the two so that our relationships can flourish to full potential. We are not just an IT service provider, but an IT service partner. At Etech 7, we work with our clients as we would any other professional associate. We thoroughly learn your present and future business strategies and suggest the IT services that best fit your business needs. We aim for our partnerships to be like conversations, in which we work together to develop the ultimate IT strategy for you. Founded in 1975, Microsoft is the worldwide leader in software, services, devices and solutions that help people and businesses realize their full potential. Microsoft enables digital transformation for the era of an intelligent cloud and an intelligent edge. Our business automation platform stands at the center of a comprehensive ecosystem of integrated solutions, best practices, and a community dedicated to everyone’s success. We are driven by our passion to make it simple for technology solution providers (TSPs) and CIOs to build resilient businesses, delivering tools that drive consistently amazing experiences for the both technology teams delivering the service and their clients who receive the service. With the hyper-growth and hyper-sprawl of today’s data, traditional data management is not enough. Data must become Hyper‑Available.Getting there requires a new approach that merges the traditional disciplines of data backup and recovery, data protection and data security. Moving from policy-based to behavior-based management to make data both intelligent, and ultimately, self-governing. As the leader in Availability across multi-cloud environments, Veeam® is uniquely positioned to help customers along their journey to Intelligent Data Management. 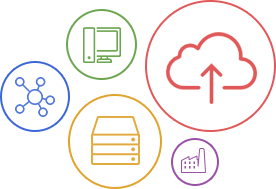 StorageCraft provides top-notch data management and protection products and solutions for the next-generation hybrid data center, be it on-premises or in the cloud. We serve organizations of all sizes, with millions of servers protected and several petabytes of data under management. Established in 2005 in Auburn, California, ioSafe was founded with the simple goal of keeping customers’ data secure.While that sounds like a reasonable goal, given the threats people and their data face every day from natural and human-made disasters, our task was far from easy. Throw into the mix that we’re incredibly demanding and wanted to create data storage solutions that are virtually invincible in the face of fire, water and other mayhem, well, it’s been an incredible ride. Today, ioSafe is winning hearts, minds, and customers with our award-winning fireproof and waterproof data storage solutions featuring multi-bay NAS and single drive USB storage hardware used across the globe by businesses and home users. CrashPlan for Small Business provides peace of mind through easy-to-use, unlimited automatic data backup and recovery. We help small businesses and organizations recover and bounce back faster from any worst-case scenario, whether it is a disaster, simple human error, a stolen laptop, ransomware and more. Our data security solution is a product of Code42, an industry leader protecting the critical data of more than 47,000 world-class organizations, including the largest global brands.